It's officially the summer of the recalls: Goldfish were recalled overs salmonella, Taco Bell queso was recalled over worries of potential botulism, and McDonald's salads were recalled over the Cyclospora parasite. Now, several major grocery stores are recalling salads over that same parasite. 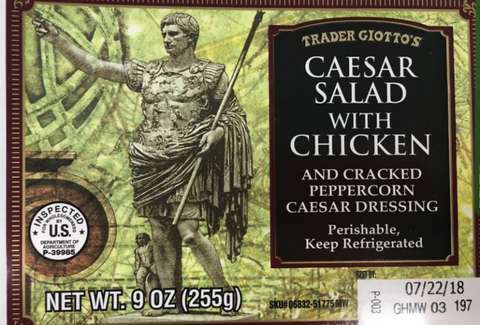 Trader Joe's, Kroger, and Walgreen's are all involved in the recall of over 25 salad and wrap products. The US Department of Agriculture's Food Safety and Inspection Service warned the public on Monday that certain products may be infected by the cyclospora cayetanenis, so consumers should be alert to any intestinal distress if they've eaten one of these products. The batch came from Indianapolis' Caito Foods, which sells to retailers like Kroger, Trader Joe's, and Walgreens, among others. The lettuce, however, came from Fresh Express, which supplies Caito Foods. Concerningly, all 25 of these products are now out of date. They were made between July 15 to 18, with best-used-by dates between July 18 through July 23. "FSIS is concerned that some product may be in consumers' refrigerators and that consumers may be at risk due to the length of the cyclospora incubation period," the FSIS warned in a statement. That incubation period is between two to 14 days. CBS News reports that Cyclospora can cause diarrhea, stomach cramps, nausea, fatigue, body aches, and fever a week or more after someone comes into contact with the parasite. Here's a list of the labels of the products that could be dangerous.